These Pediatric Instruments are manufactured using quality basic material and are appreciated for accurate readings and reliable performance. They are highly acknowledged for features like optimal quality, low maintenance, easy usage and energy efficiency. These are available in various specifications based on the requirement of the client. They are accessed at a cost effective price. We offer a comprehensive range of trolleys which are used in moving things from one place to another. They find their application in various pharmaceutical industries, clinics, hospitals, to keep all surgical equipments during an operation. These are available in various specifications based on the requirement of the client. These are accessed at a cost effective price. Selection mode of control either through Air mode or through baby temp. mode. Our range of Digital Radiant Heat Warmer is used for specific purposes in diagnosis and treatment processes. These are designed with various special features for use in Nursery, Labor & Delivery suits to provide quick & effective treatment for the newborn infants. Clients can avail from various ranges with various international standards. Our range of Economical Digital Radiant Heat Warmer is specifically designed to provide efficient and rapid treatment to newborn infant who are suffering from extensive heat loss. 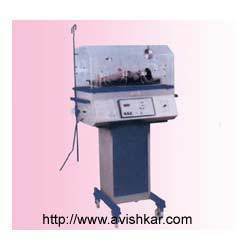 They are widely appreciated for features like easy to use operations and maintenance free. These radiant heat warmers mainly find their application in delivery rooms and intensive care units. Audiovisual alarm for sensor failure. Clients can avail from us a wide range of Radiant Heat Warmers with Photo Therapy Units which are made from high grade material and with the set of international standard. These products are ergonomically designed with accurate dimensions & extensively tested, at every level to offer a perfect range of product. They are accessed at affordable prices. 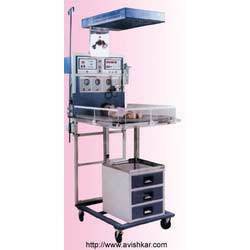 We take pride in proving an extensive range of Latest Servo Controlled Premature Baby Incubator (3 Display) made from high grade material with various temperature settings. This is known for features like soft touch control panel, precise reading of temperature and is uncomplicated to use. 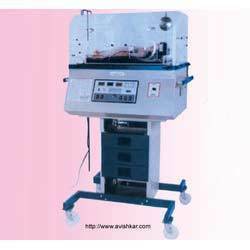 They are made in various specifications based on the condition of the premature babies till they are ready to be brought out to the external environment. 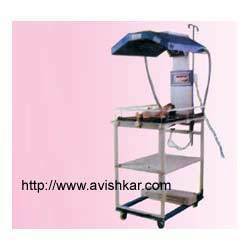 Phototherapy has been developed for the special purpose of lowering the serum bilirubin level of a new born children. Phototherapy is widely used method of treating neonatal jaundice as it is far safer & more simple to perform than exchange transfusion. The cause of neonatal jaundice is due to excess amount of bilirubin in the blood which if allowed to concentrate in the brain can result in irresible brain damage. The action of blue light has been shown to brake down bilirubin thereby effectively reducing its concentration & venting brain damage. It is generally accepted that light in the visible blue spectrum with wavelength 420 to 480 nanometer is of most therapeutic value & hence blue tube lights transparent filter or white tube light with blue filters are used in phototherapy units. 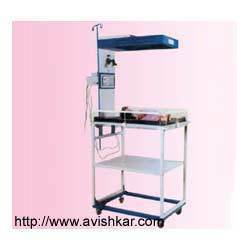 It is believed that if the distance of 45cms between phototherapy source & neonatal child is kept then the wave length of 420 to 480 nanometer is achived. We have gained vast experience as manufacturers, suppliers, and exporters of a broad gamut of Pediatric Instruments including supreme quality Special Type Of Jointless Oxygen Hoods. We produce these by using the finest grades of raw materials that are safe and hygienic for young patients. We follow strict norms of quality by complying with set industry norms to manufacture these in our state of the art facilities. It has a jointless construction that makes it long lasting and oxygen inlet from top with neck adjustment features. 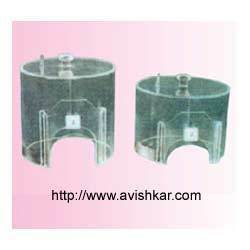 These are offered in various sizes to suit requirements and offered at budget friendly prices to our valued customers. We are reckoned as reputed manufacturers, suppliers, and exporters of a wide array of Pediatric Instruments including premium quality Oxygen Hoods. We manufacture these by using premium grades of raw materials that are safe and hygienic for pediatric use. We maintain stringent norms of quality to manufacture these in our state of the art facilities in line with international standards. 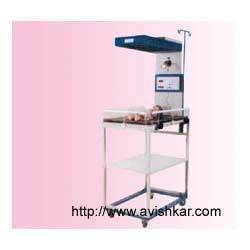 It is provided with wide port hole for easy handling of the baby and neck adjustment facility for flawless fit. It can also accommodate a wet sponge and has a seamless inlet for oxygen. These are offered in different sizes to suit requirements and can be availed at reasonable prices by our prestigious clients.